The whole point of keyframes in video protocols like h.264 is to reduce the number of times you need to send a full frame of image data. With the above scenario, you might as well be sending the frames as a series of JPEG images in sequence. There’s a lot more to this, like the fact that media has to be packaged in 188-byte packets which creates added overhead when you do it too much, but hopefully now you’ve got the gist of it: HLS is a poor choice when it comes to low latency video streaming. 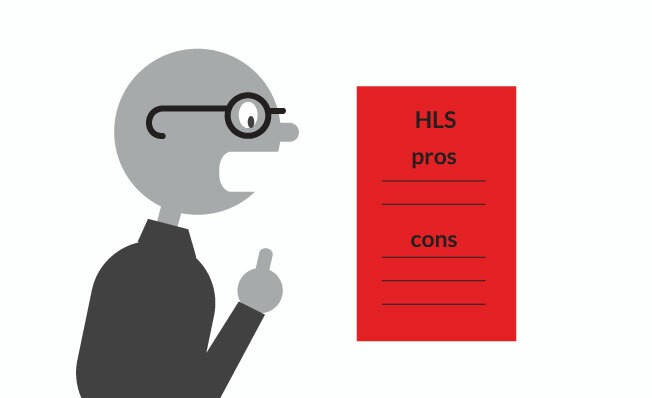 HLS is a subscriber-only protocol. Unlike WebRTC, which has a spec for publishing from a browser, HTTP Live Streaming only supports playing streams. If you want to publish a live video stream for a device, you simply have to look for other technology to do this. Luckily with Red5 Pro, we have alternative SDKs for mobile that allow you to create publishing apps that utilize RTP; you can then relay those streams over HLS for folks to view these streams right in their browsers. You can check out our HLS player example using video.js on GitHub. What we’ve also found is that if the app is a communication app--meaning that you have some form of two-way communication like Periscope has with live chats--then they tend to group the app in a different category. Apple also considers video calling apps like Skype to be in a different category, and the live streaming restrictions of having to use HLS don’t apply. The other good news is that as the popularity of apps like Periscope and Meerkat continues, Apple is getting used to the idea of live real-time streaming apps, and is gradually becoming more and more flexible with the restrictions.